Let’s say you are using Microsoft Outlook and you have to design & send a HTML email (for example, a HTML newsletter with some text & images). First of all, you will quickly learn that – if you design the email using Outlook or Word – the email source code will actually render badly on other email clients. This happens because Outlook is generating the email source code using mostly VML (Vector Markup Language) which is poorly supported by other email clients. You will have to somehow import a clean HTML source code, to an Outlook email, in order to get it displayed correctly on most email client applications. To insert your own HTML email code, there are many articles on the web advising you to drag and drop the HTML file over Outlook or insert the HTML file using the “insert as text” feature. Well, they are simply wrong. You will soon discover that Outlook alters / converts your HTML code: there is no way to insert your own, clean HTML code to Outlook by simply doing a copy / paste or drag’n’drop operation. 3. use Bells & Whistles for Outlook: it adds an “Insert HTML” button to your Outlook email editor, making it extremely easy for you to select a HTML file and insert its HTML code to your Outlook email. 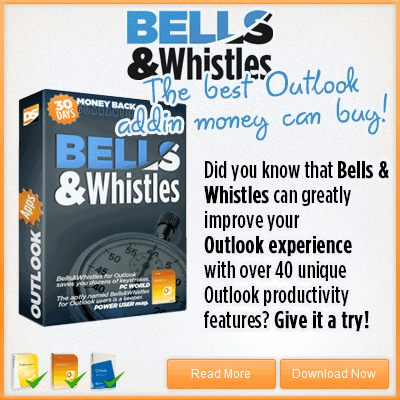 Assuming you’ve downloaded Bells & Whistles (download link), all you have to do is to open a new Outlook email, then go to the Bells menu and click on the big blue “Insert HTML” button and browse to select the HTML file that will be loaded in your email. That’s it! If you don’t want to use the Bells & Whistles addin to insert HTML code, we will describe below a programmatic way to add your own HTML code to Outlook emails without having it altered by Outlook. Make sure you are not using a trial-expired version of Office (Developer mode is disabled in expired Office trials). The following procedure was tested on Microsoft Outlook 2010 and 2013. While the above HTML insertion method is far from being a 2-clicks solution, it actually is the simplest method to insert non-altered, clean HTML code to Outlook emails. Although it surely is counter-productive to use this method on regular daily emails, it can be a helpful solution if you are sending an email newsletter through a mail merge add-in like Easy Mail Merge. 3. Make sure you use HTML tags & attributes that are actually supported by Outlook. 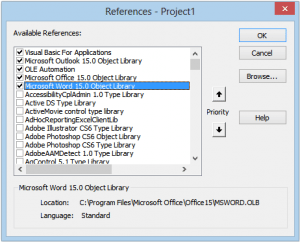 Outlook is designed to support only a sub-set of HTML 4, so some HTML tags are simply ignored. These tags are not removed from your email code (they will display just fine on other email clients that support them), but Outlook skips them. Here is a list of ignored email HTML tags. Hi, you can also use “Attach File” button in “Include” tab of new email window in Outlook 2013. In attachment window, select HTML content file you want to add to and just choose “Insert as Text” option under “Insert” button menu. 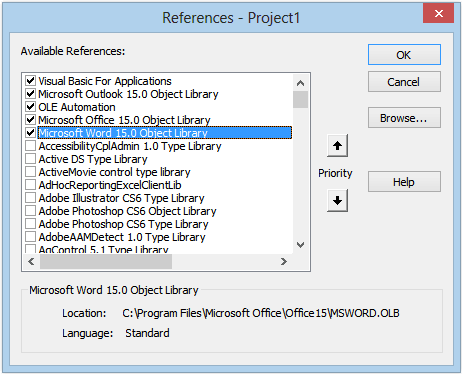 Yes, you can also use this option, but Outlook will scan the HTML code of the attached file and it will alter it. Can you explain how to enter the “absolute path for the HTML file” when using the macro method? I put the file in my C: root folder and changed it to “C: test.htm” (the name of the file) but I get the error “The document name or path is not value. ( )” when trying to run the macro. If I try to specify the path using either forward or backslashes, I get a compilation error. Make sure you have no spaces left in the path. Also make sure the file extension is correct (check if it’s htm or html). The curly quotes in the example are breaking the macro. 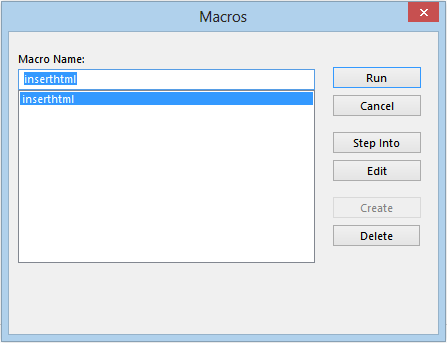 Just delete them in the macro and retype regular quotes (“) and it should work. this is what i did.. I edited the macro again. then was able to run it successfully in creating new email. It seems strange but this method also worked for me. I changed the double quotes ” to single quotes ‘ and the false turned green. then I changed them back and altered the path to “C:UsersusernameDesktopinserthtml.htm” and now it works 🙂 Thanks a lot for this answer!